The practice of customer stratification allows LBM business leaders to focus on your best customers and minimize time wasted on unprofitable partnerships to maximize business growth. With competition growing from online vendors and global enterprises, retaining a loyal customer base and growing profits takes more work than ever before. Leaders in the lumber and building materials industry know that not all customers are equal—some bring in big sales but come with big demands, while others offer steady revenue with minimal effort. 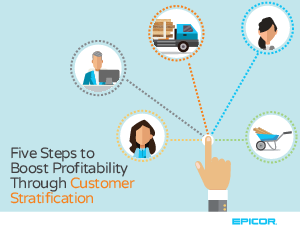 Customer stratification is a tool that can help your organization identify which clients warrant greater investments of your time and energy and which ones erode your profits by overloading your resources with demands. Armed with this information, you can optimize prices, improve negotiation, deploy your sales force more effectively, optimize compensation, grow in new ways, and increase the impact of your marketing efforts.